As mentioned earlier, the Amicus18 IDE is equipped with the powerful Proton Basic compiler specially adapted for the Amicus18 development platform. You can download it from the Free AMICUS18 Compiler section on Amicus website. The Amicus18 IDE is currently provided for Windows platform only. Installation and setup process is pretty straight forward. 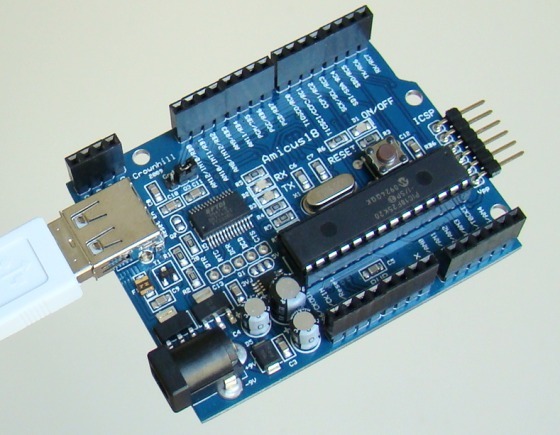 The Amicus18 board uses an FTDI serial to USB device, which presents itself as a standard COM port on the PC. This requires USB drivers to be installed the first time the Amicus18 board is connected to the host PC. This is a simple process and a step by step guide is provided in the Amicus18 hardware manual. My machine has got Windows 7 (64-bit) and for some reasons, I have to install the USB driver twice to make it work. The Amicus18 IDE has a very professional look (see a snapshot below). The integrated bootloader application allows you to directly download the compiled program into the target microcontroller. The IDE also provides a serial communication terminal to monitor the data transfer through the COM port. 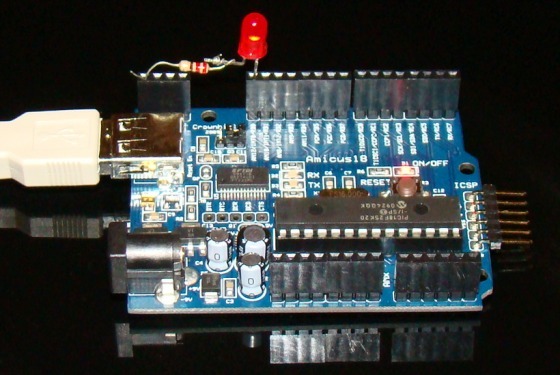 Now let’s test the whole setup by doing a very simple experiment of flashing an LED connected to one of the I/O pins of Amicus18. This is the best project to begin with any new development platform because it makes sure that everything is correctly setup and ready-to-go for more advanced projects. 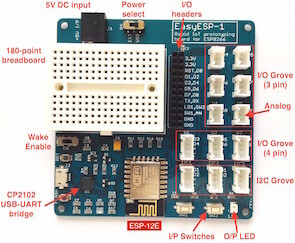 The anode pin of the LED is connected to RB0 pin, whereas the cathode is grounded through a 220? resistor in series. The setup is shown below. BASIC, in general, is a very simple and easy-to-learn high-level programming language. 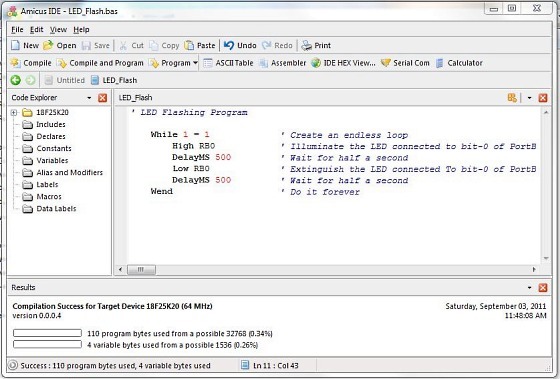 The following six lines of code written in Proton Basic compiler using the Amicus18 IDE makes the LED connected to RB0 pin flash at the rate of 1 Hz. Connect the Amicus18 board to the host PC, and click on Compile and Program button on the IDE to compile the source code and load the output HEX file into the flash memory of PIC18F25K20 (I am using the default 3.3 V PIC device). Once the download is complete, the PIC will be reset shortly to execute the newly loaded program. 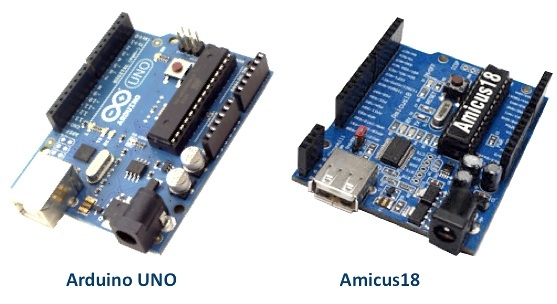 If there were no Arduino, Amicus would not exist too (at least in the current form), but both of them are completely different platforms. Arduino has been a wonderful tool, introducing many people to the world of embedded systems with little or no prior knowledge of electronics. The open source nature of Arduino has resulted in the availability of dozens of shields that allows the hobbyists to do many creative things. 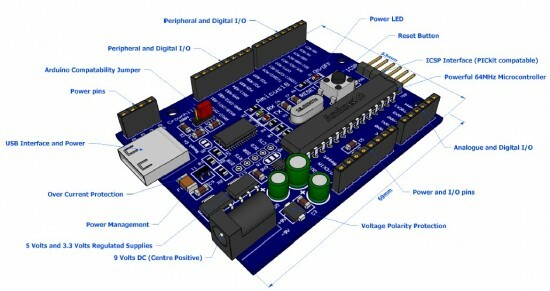 The Amicus platform opens that same gateway to the fans of the PIC microcontroller. 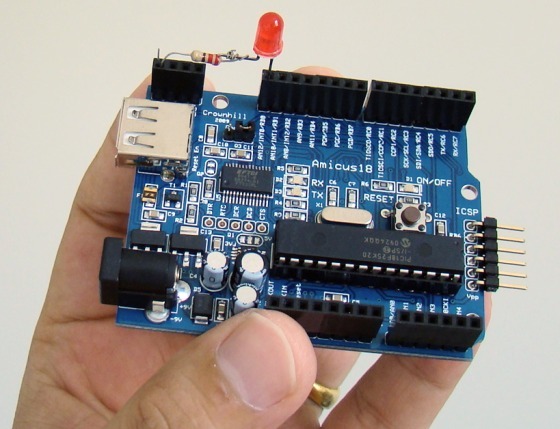 The physical compatibility of Amicus18 with the Arduino board gives the PIC-lovers an opportunity to take advantage of the massive amount of low-cost Arduino shields. Backed up with Crownhill’s professional Proton Basic Compiler, the Amicus platform presents the PIC microcontroller into a much simpler and powerful form to teachers, hobbyists and professionals. The Amicus18 compiler now also supports the PIC18F25K22 microcontroller, which settles the compatibility issue with the 5 V devices. It would be great if the Amicus18 IDE could support bootloader programming for this chip too. Right now, if you use PIC18F25K22 with the Amicus18 board, you need an external ICSP programmer to upload the HEX file (correct me if I am wrong here). Then the suppliers can consider providing both the options (PIC18F25K20 and PIC18F25K22) of the Amicus18 board to the buyers. The Amicus18 board is open design, which means you can make one by yourself. If you want to purchase a ready-made board, Newark is one of the suppliers of the Amicus18 board. They also provide the Companion Shield for it. I will be posting more tutorials and projects on Amicus18, so stay tuned! the link for the Official Amicus Website is broken. Where an I buy an amicus18 board in India? The official web site of amicus is not openin. Please help. The problem is that it has a “only for Windows” IDE, a big drawback compared with Arduino. Instead of Amicus I would recommend to use pinguino board.